Four local charities were presented on Friday 19 January 2018 with money raised by the Ashby Rotary Clubs’ Santa collections. 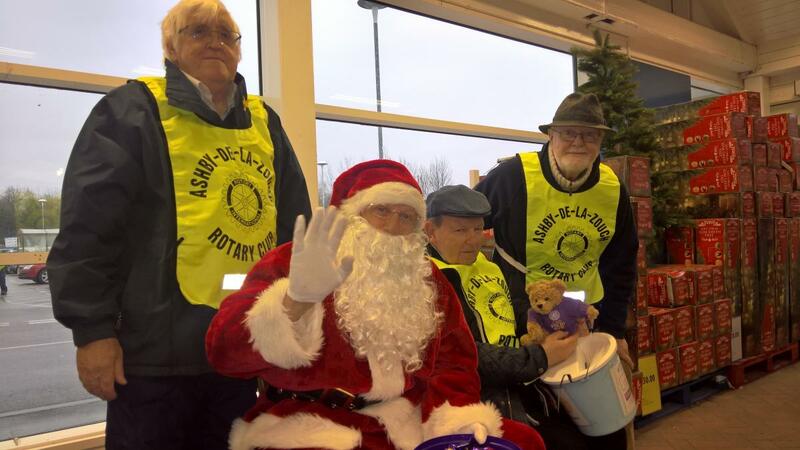 The three Clubs were able to present £4500 each, thanks to the generosity of Ashby people who gave unstintingly to collectors who accompanied Santa on his visits to Ashby and the surrounding villages. Ashby Castle Rotary Club President Carol Eyley presented cheques to CEEP and Measham Youth Centre. Steve Berrill of CEEP said ‘The heart of the charity’s work is to engage with the people of the community in North West Leicestershire, by helping them to develop and progress and reach a better future’. The project is based at Hall Farm, just outside Ashby on the A511 to Loughborough. It has several full-time leaders and a team of volunteers to help run the educational projects. John Roberts, President of Ashby Hastings Rotary Club introduced Helen King of Burnaid. She said ‘Burnaid is a small local charity that aims to support burn survivors and their families at the Burn Centres at Birmingham Children's Hospital and the Queen Elizabeth Hospital Birmingham. These two Burn Centres are the only two for the region serving a population size of ten-and-a-half million and extending over a 70 mile radius around the two hospitals. Finally, Phil Dyer, President of the Rotary Club of Ashby de la Zouch presented the cheque to Indila Simandi of Steps. She told the audience ‘Steps was started in 1994 by four families who recognised the benefits gained by their children from conductive education which is an innovative learning process pioneered at the Peto Institute in Budapest, Hungary. Conductive education recognises that children with motor disabilities can develop in the same way as their able-bodied peers. It focuses on the child, not the disability.